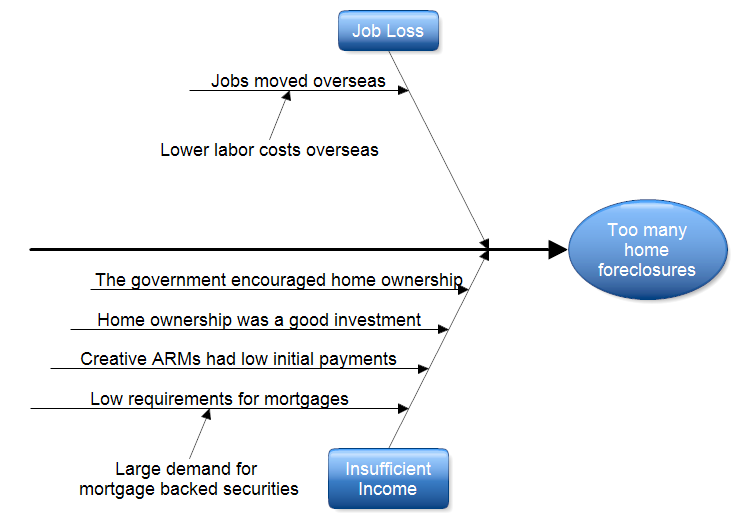 Description This fishbone diagram deals with the home foreclosure problem of 2008 to 2009. The problem is placed on the right with a large arrow pointing toward it. People foreclosed on their homes because they lost their jobs and were unable to pay the mortgage or they got into a mortgage they never really could afford. These two causes are placed in boxes with lines connecting them to the large backbone arrow. Next the primary and secondary causes are listed. For example, people got adjustable rate mortgages that had low initial payments. When the payments increased, the home owner was unable to meet them. As long as home prices rose, the home owner could borrow on his home to finance the mortgage. The bubble burst when housing prices started to fall. Drawing Instructions If you haven't already done so, first download the free trial version of RFFlow. It will allow you to open any fishbone diagram or cause-and-effect diagram and make modifications. For instructions on how to draw a fishbone diagram, see How to Draw a Fishbone Diagram. Once RFFlow is installed, you can open the above fishbone diagram in RFFlow by clicking on fishbone-1.flo. From there you can change the text, move shapes around, and make your own fishbone diagram. It is often easier to modify an existing fishbone diagram than to draw it from scratch.